Intermittent Fasting: how I use this way of eating to manage my weight during the menopause. 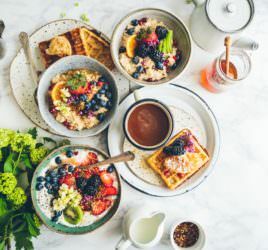 “After overindulging in bread and cheese on holiday in France earlier this year I returned home 4lb heavier, which made my size 10 clothes feel uncomfortable. Until then I’d always been able to quickly lose any weight gain within days simply by returning to normal eating — three healthy meals a day. But this time, thanks to being menopausal, that didn’t happen. As a nutritionist I don’t subscribe to faddy diets, but the evidence for intermittent fasting as a lifestyle choice is so compelling I gave it a go and it’s done the trick. Simply by ensuring that I wait at least 16 hours between meals, I’ve now lost 8lb in two months — twice what I needed to. I tend to fast during the day and eat two meals in an evening, one at around 5pm and another around 8pm. When I break my fast, I ensure half my plate is filled with vegetables and the other half with protein such as chicken, lentils, or halloumi cheese. Have you considered Intermittent Fasting, but not sure how to start? Perhaps for weight loss or simply as a way of eating? I’m a huge fan! 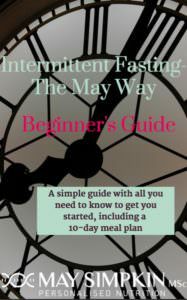 I’ve written a comprehensive beginner’s guide that explains the concept of Intermittent Fasting, the benefits and above all, how to get started with Intermittent Fasting and stay healthy. I’ve even included a 10-day meal plan so you know what type of meals to include to stay on track. As always, my advice is simple, easy to understand and even easier to implement. CLICK HERE to access this comprehensive Beginner’s Guide.